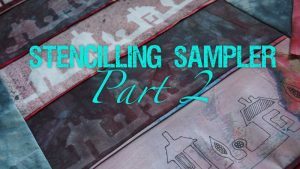 In this archive collection of 3 videos Linda demonstrates a wide variety of creative techniques using stencilling to produce beautiful and unique designs. She describes her favourite products and explains every step of the process to make a really attractive wallhanging. Finally she explains the hows and whys of completing the work with machine quilting. Linda proves that you can achieve lots of very different results using just one stencil. All of the techniques she includes could be used in many different projects. In the first of three videos Linda explains how a simple stencil can be used to create both positive and negative shapes on paper and fabric using a range of products and techniques. First she uses Markal Paintstiks together with her handmade house and tree stencil to transfer the design onto strips of gorgeous hand dyed fabric. Next she shows how the same stencil works to produce very different visual effects with pump action bottle or aerosol spray paints. Finally she shows what can be achieved using discharge paste through the same stencil to remove colour from the fabric rather than add it!. Such a range of lovely results all from a single stencil! In the second video of this archive Linda demonstrates even more creative ways to use the same stencil. Permanent pigment pen is used to produce linear designs and to add fine detail to stencilled shapes. 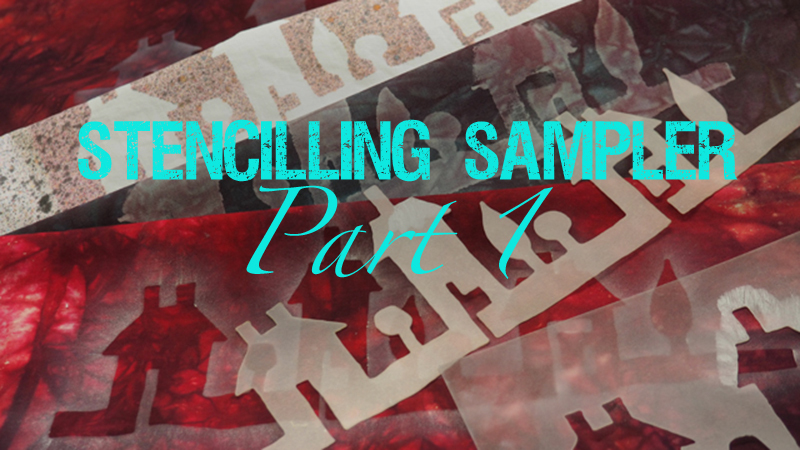 She applies fabric paint to make outlined shapes have more visual impact and explains how she uses a household foam roller to apply a delicate layer of acrylic colour to brightly coloured hand dyed fabrics. All of the technique sample strips are pieced together to make a long narrow hanging and Linda shows how folded inserts introduce a flash of vibrant colour that helps bring all the separate elements together as a cohesive whole. 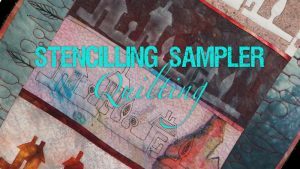 In the third and final video of this series Linda shows how quilting has added texture and substance to her finished hanging. She explains the reasoning behind her choice of thread type and colour and gives tips for finding confidence with free motion quilting. The outer borders are quilted with a sympathetic design created by selecting individual features from the main body of the hanging.